Publisher Taschen has added some new titles to their Little Book series and sent some over for me to check out. Each book is a palm-sized 192-page paperback that's quite affordably priced at US $10. I've previously featured the books for Captain America and Spider-man. This is a quick guide to The Avengers comics that have been published over the years. Due to the number of characters featured in The Avengers, there's lots of turmoil and over the years, the members come and go. This book looks at the characters and where the come from and the cross-overs. I didn't even know that there are so many spin-offs, such as West Coast Avengers, New Avengers, Dark Avengers, Young Avengers, Avengers Academy, Great Lakes Avengers, Tails of the Pet Avengers, Lockjaw and the Pen Avengers and Uncanny Avengers. Most artworks are from the 60s and 70s, with a smaller portion from more recent decades. This book is not a comprehensive guide so there's no detailed profiles for each character. But it's an insightful guide to see how the Avengers team has evolved. 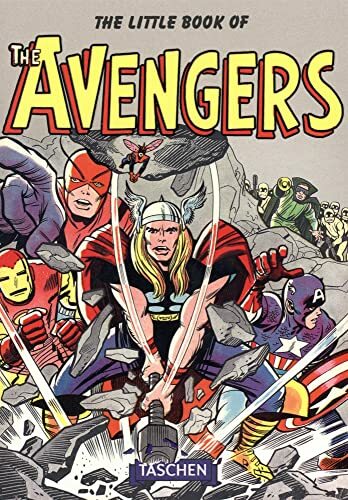 I only know of Avengers through the movies so I picked up a lot of backstory and history from this small book. It's quite a good read. The reproduced artworks look great too.